“No one’s going to tell you this is a good idea,” Nick remarked, sipping his coffee. “That’s why we should do it.” Sarah and I, sitting across the table from him, laughed nervously. Hello from the other side, friends. It’s been a while since I’ve written. Last we spoke, I’d nearly finished pushing my book about this project out into the world. Those who have followed this story for any stretch of time would be forgiven for presuming it ended, tidily, there — that I’d quietly left this blog to collect dust in this little corner of the internetz. In fact, that’s exactly what I intended to do. Except life doesn’t really work that way. So let me bring things up to speed here. 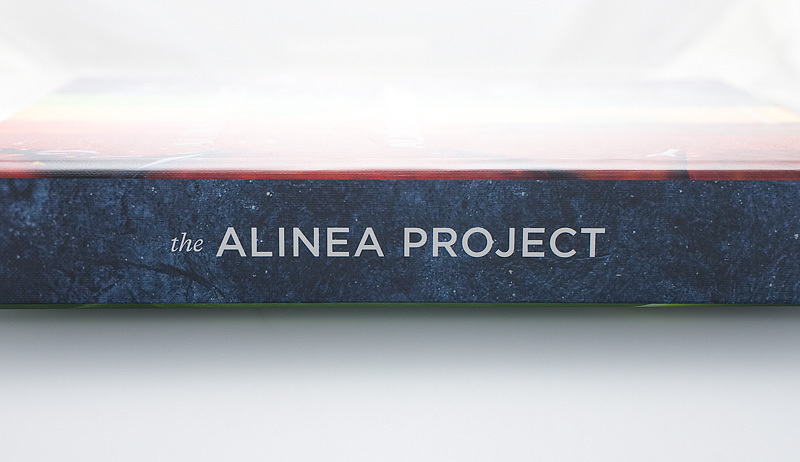 After Sarah and I had completed our work on The Alinea Project, we sent the first three copies from the printer to Martin Kastner, Nick, and Chef in Chicago. A few days later, I got a phone call from Nick. So, pushing through that I began to do. Now, for the bulk of this project, I’ve tended to present Sarah mostly as a spectator and supportive voice to my cooking adventures. This probably gave the impression that I’m some sort of loose-cannon mad scientist, and Sarah was constantly trailing behind me in an exasperated-but-nevertheless-endeared huff, quietly supporting me while cleaning up all my messes. The truth of the matter is that Sarah is an amazing artist, which is part of why I married her. We are a family of makers, and she has her own projects and interests that she pursues as diligently as I pursue my own. She chooses to be less public about it, which I admire and which frankly makes me feel like a blabbermouth most of the time. But, in the prospect of freelancing for Alinea, we found an opportunity to join forces as a team for them. Sarah is fluent in languages of design and composition in ways that I’m not, and we found that things like designing websites, books, videos, etc. offered us ways to bring both of our skillsets to the table in a complimentary way. And we were ecstatic to do so with the team at Alinea. So we began working on things that we know how to do well, that serve a tangible purpose for Alinea (and Next, and the Aviary, and now Roister), and that we could accomplish in our free time from our home in Oakland. This included web design, a fair bit of graphic design (menus, labels, logos, etc), a handful of Next’s cool ‘teaser’ videos, and other mostly-digital handiwork. I even got to help design the sign in front of Roister, which felt pretty badass to see in real life for the first time. The prospect of packing up our lives and moving to Chicago to work at Alinea was both exhilarating and terrifying for Sarah and I. It represented a drastic career change for us both, which carried with it some nebulous financial ramifications, a total lifestyle change, moving far from friends whom we love very much, and immersing ourselves in an industry where we felt acutely like ‘outsiders’. But the idea of being jetsetting artists for Alinea — of working together, getting to immerse ourselves in the world of fine dining that we’d grown so infatuated with, and of getting to work creatively with artists for whom we had great admiration — was an unarguably romantic picture in our minds. We spent weeks discussing and wrapping our heads around all of these issues. But just as we were getting comfortable with the idea, something else happened. 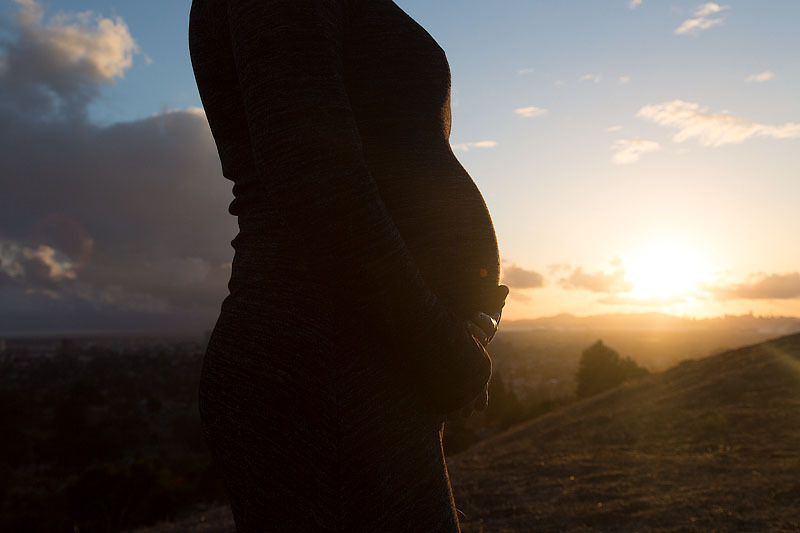 There’s no real way to predict what changes becoming a parent will bring. While Sarah and I had previously been able to work through some emotional turmoil and plan for a hypothetical career change, the prospect of parenthood aggressively rebooted all of that. We felt suddenly lost, and in need of advice. We knew that we were unable to anticipate what to be considering as parents, and so we asked our own parents for guidance. What factors would grow and shrink in importance that might sway our decision to move to Chicago or stay put? What things should we be weighing that might help us decide whether or not to take this plunge? Both Sarah’s parents and my own offered a similar response: “Just do what makes you happy; we’ll support you no matter what you choose.” This is a lovely, beautiful sentiment, and she and I were both grateful to be so fortunate as to have parents who would say this to us. But the thing was: we didn’t actually know what would make us happy in the long term. We didn’t really know where our blind spots were. I’d like to think there’s a part of me that believes in phrases like “It’s healthy to do things that are uncomfortable, that’s how you grow,”, or embraces that whole bohemian, carpe-diem/YOLO attitude towards life. I mean, my friends Joe and Kris quit their jobs, sold their house, bought a bus, converted it into a mobile home, and have been touring the country for the over a year. The balls that takes! They’re my heroes. Then there’s Brenda and Taisuke, globe-trotting friends who have lived in nearly a dozen countries, raising their small son the whole while without ever expressing any outward sign of hesitance or fear. I’d like to be like them. 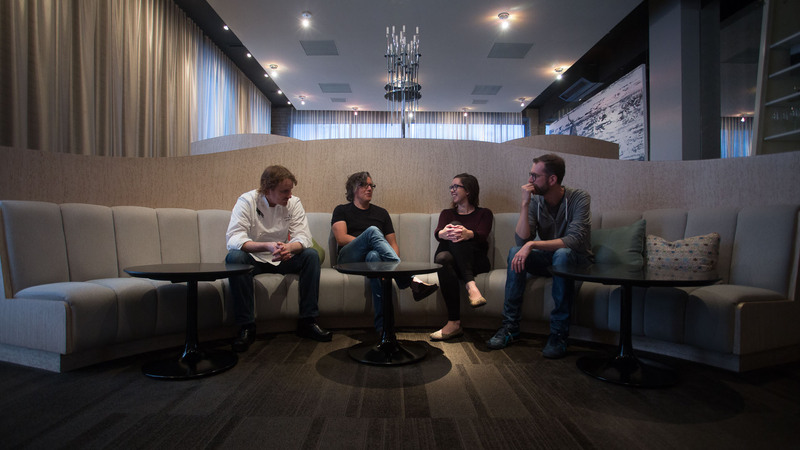 If I’m being totally honest, the comfortable ‘end’ to this Alinea Project story for me is simply having been invited to work there. I could rest easy in the satisfaction of knowing I’d done a good enough job to turn the heads of the people whom I most admired…without actually having to take any real risks or do any hard work. It’d be a good story for me to have in my back pocket, and I could continue in my very comfortable career without any big disturbances. And surely, surely this would actually be the better, more-pragmatic move when I consider that I’m meant to be caring not only for myself, but for a wife and now a child, right? And yet, I’m writing this now from our apartment in Chicago. We did the thing: we left our jobs, packed up our lives and our little baby daughter and moved across the country. Sarah and I are The Alinea Group’s Directors of Media & Design. We’ve been here a couple of weeks so far, mostly spending our time meeting people, getting our feet under us, surveying our surroundings and collecting ideas/information for things we’d like to try helping with. So what ultimately helped me push through my doubts? As fearsome as this drastic lifestyle change is for Sarah and I, it’s unarguably unique. It’s forcing us to learn a massive amount of new stuff; new approaches to problems, new questions we have to ask each other, new ways for us to think about ourselves and communicate with each other. So, one of the biggest reasons we’re choosing to push through the nervous fear we have is because we want to be able to be useful to our daughter if she ever has to deal with a situation similar to this in her life. We want to be able to offer advice or experiential wisdom to her; we feel it is our responsibility as her parents to challenge ourselves, and for her to see us do it. And, I mean, of course we’re also doing this because it’s awesome. I recognize this is an unconventional way to deploy this kind of information, especially after the multi-year setup this project has been. But it feels inauthentic to hide my thoughts and anxieties behind a banner of faux bravado. And part of me thinks the challenges making it to this point are apropos: this entire project has been less a story about magic white powders or fancy kitchen equipment than it has been about growth, and this critical, once-in-a-lifetime turn of events is nothing if not a massive exercise in that for me. So. This is the continuation of my Alinea Project, except maybe the project now isn’t so much figuring out how to hotwire heat chambers in my kitchen or source odd ingredients (though hopefully that will continue). But this is a re-invention, the beginning of a new train of thought for me and my little family. Documenting your transition, Allen, from the times of running the Kickstarter campaign for The Alinea Project to what you have accomplished today, really inspires the community of creatives across multiple disciplines. I for one am continuously pursuing a career change or rather an evolution of sorts. Your work is a solid proof of how relationships are built, tapping onto something greater than the sum of the parts. Making, designing, communicating ideas, and connecting with people half way around the world; luckily I found out about your work years back while I was challenging myself with a new life project taking place in China, now moving into Mexico as I am getting closer to mastering my game into new territories…Chicago might be next up. That said, I would love to learn more about your coming endeavors.